Creating a short list of must-eat, must-drink Magic City restaurants is like trying to find a maxi skirt on South Beach; all but impossible, says Ana Connery. Her two-part guide to eating out in Miami starts with hearty flavours and a down-home ambience; look out for her preview of upscale joints later in the year. Buen provecho! Ruby red bar banquettes spill onto an indoor-outdoor patio that’s packed with people as well put together as the drinks at the Sugarcane. Part of an unusual selection of fruit-laced beer cocktails, the orange-blossom Big Squeeze is like a bottle of sunshine. 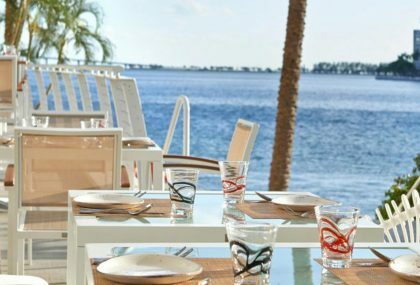 For a light, tropical meal under whirling rattan fans, the sprawling oyster bar also serves sushi and sashimi. A Japanese robata grill is for those who like their skirt steak slow-cooked tender, perhaps with a little squid on the side. The generous tapas menu surprises with a tasty pork belly salad and a duck and waffle pairing that proves the food is as creative as the mismatched furniture. Touristy South Beach has few restaurants that lure locals, but this James Beard Award semi-finalist is the exception. Wood beams and comfy, high-backed booths set a warm, friendly tone that reminds you this is still the South (don’t be surprised to hear dinner called supper here). Come hungry and in a group, so you can sample. Start with devilled eggs and black-eyed pea salad, before moving on to the fried green BLT prepared with pork belly and house-made pimiento cheese, or the Yardbird signature chicken and waffles with Bourbon-laced maple syrup. About the only light dish here is the watermelon salad, and even that deserves mention thanks to a generous helping of fragrant herbs. Parking is hard to find here, but you’ll probably be glad of the long walk to your car. Longevity is elusive for many restaurateurs in trendy Miami, but not Michael Schwartz. He has managed to build a following so loyal he’s opened several successful Miami eateries since debuting Michael’s Genuine in 2007, including the Cypress Room and Restaurant Michael Schwartz on Miami Beach. The goateed Schwartz is beloved for his craft beers and ever-changing menus that celebrate the bounties of local ranches and farms. Dishes are ordered in sizes ranging from small to extra large, so you can nibble or indulge depending on your mood. The crispy rice cake made with chorizo and Florida rock shrimp is a perennial winner, as is anything slow-roasted in the wood-burning oven. Longtime pastry chef Hedy Goldsmith creates fruity concoctions so good they might even make you forget chocolate (try the Creamsicle pot de crème and buttermilk doughnuts). With a small courtyard and the ‘everybody knows your name’ bar vibe, Michael’s Genuine manages to stay low-key in one of the more pretentious neighbourhoods in the city. Locals love this cozy comfort food hotspot as much for bubbly chef and owner Michelle Bernstein, a frequent judge on Top Chef, as her talent for juxtaposing tastes and textures (her curried take on butternut tagliatelle all but sings in the mouth). Strut your stilettos across the concrete floor and tuck yourself into one of the tangerine banquettes that run along one wall, so you can admire the chandeliers and signature white furnishings covered in tropical fabrics that have become the city’s calling card. Start your meal with this hometown girl’s refined version of Cuban croquetas filled with Serrano ham and blue cheese alongside sweet fig marmalade. The small restaurant in the revitalized Upper East Side scores raves on social media for the simple fact that guests with reservations are seated promptly (a welcome change from trendy places that herd customers to a bar for a seemingly endless wait). When two top local chefs – Michelle Bernstein and Michael Schwartz – share where they eat on their day off, you can bet it’s worth a visit, even if it is lacking in the décor department (vintage lunch pails are the accessory of choice here). Don’t let the cafeteria vibe fool you. Dishes like pork and beans may not be pretty, but they’re hearty and tasty. Young chef/owner Danny Serfer is as down-home as the diner ambience, always wearing a smile and a baseball hat with his splattered chef’s whites. He wants regulars, not scene-seekers, hence why his Mac and cheese is memorably made with trugole, cheddar, Parmesan and rock shrimp. A ‘veg chalkboard’ lists two dozen sides that include old-school faves like cauliflower purée and cheese grits, each for $5. Wind down with a Panther coffee not just because it’s a tasty way to wrap, but because it’s served in a retro plaid thermos, making you feel working-class hip while you sip.